The Safari Browser on Mac offers a Clear History tool that allows you to Clear your entire browsing history on Mac and also offers the options to Clear Yesterdays, Today’s and Last Hours browsing history. Although, the option is named as “Clear History”, it actually deletes Cookies and also the entire browser cache, in addition to deleting your browsing history. Safari browser also offers a way to clear individual websites or specific web pages from your browsing history on Mac. However, this option is somewhat hidden and not readily recognizable for most Mac users. Follow the steps below to clear your entire Safari browsing history on Mac. 3. You will see a pop-up, click on the top/down Arrow bars next to Clear (See image below). 4. 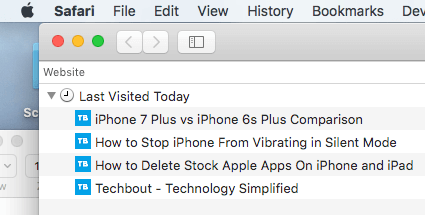 Clicking on the Arrow bars will provide you with various options to clear Safari browsing history on Mac. 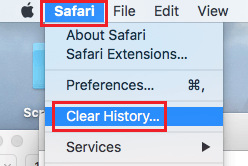 Click on All History and then click on Clear History button to clear all your Safari Browsing history on Mac (See image below). As mentioned above, the Safari browser on Mac also provides an option to delete individual websites or web pages from your browsing history. 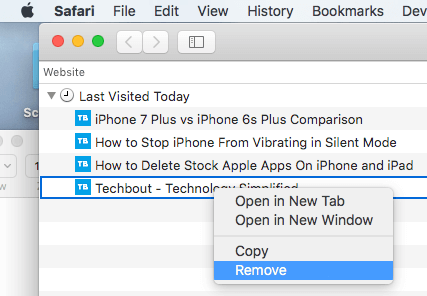 Follow the steps below to clear individual websites from Safari browsing history on Mac, instead of deleting all your Safari browsing history. 4. Right-click on the web page or website that you would like to remove from your browsing history on Mac and click on the Remove option from the drop-down (See image below). Alternatively, You can also select any entry in the list of websites visited and just hit the Delete key on your keyboard. 6. To delete multiple web pages, you can select items in the History list by holding down the Shift Key and hit the delete key on your Keyboard.